Variety Club - This charity has arranged for the funding of our first minibus which was supported by the ACI UK Ltd. A number of students went for the day to Brocket Hall for the presentation. There were entertainers there especially for them and food for those who could manage it. The students have already benefitted from the transport to get them out and about. We were lucky enough to receive the 5000th mini bus presented through the Variety Club and because of this the Variety Club decided to fund it themselves. 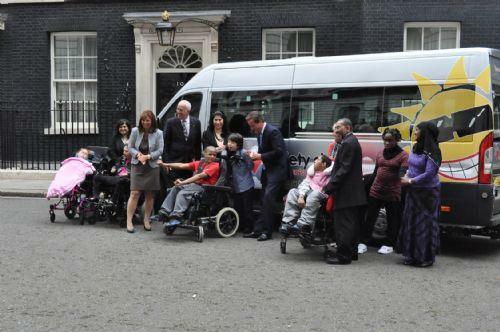 Because it was such an important occassion for them it was arranged for the bus to be handed over by David Cameron at Downing Street. We took six students, members of staff, a parent governor and of course the Head teacher. It was very exciting for all and we have the photos to prove it. Again the students are benefitting from the freedom to enhance the curriculum by getting out of the school environment for some of their learning.